1 of 1 Heat oven to 400 degrees . 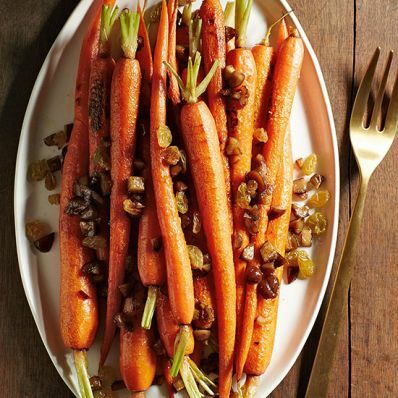 On a rimmed baking sheet, toss carrots with olive oil, 1/4 tsp of the salt and the pepper. Roast at 400 degrees for 15 minutes. Stir in chestnuts, raisins and honey. Roast another 10 to 15 minutes, until fork-tender. Gently toss carrots with remaining 1/4 tsp salt.